It states that there is no disk it can recover the image to. And yes the SSD disk is recognized because it shows up in the list of possible disks to exclude. That’s weird. I simply went to the bios and made it find and add the disk, unplugged my hdd with windows on it, and it worked fine. I also got the option to exclude my SSD in the recovery window, but since I was cloning to it I didn’t obviously. What drive are you trying to clone to? As in, what brand, size etc.? Also, are you sure your diskimage you made has a small enough partition/size that it fits on your new SSD? I didn’t even need to go to the BIOS, as it recognizes the attached disks automaticaly. I just need to press F10 after the restart and then I can choose, from a list, which drive to boot from. I have 1TB HDD with ~80GB system partition and another partition with 630GB which contains a few programms and games installed(thus I want to cloen it as well) and 2 another not important partitions. I want to clone it to my new X25-M Intel SSD 80GB. The content of my both 2 first partitions is about 35BG(20GB from system partitions and the rest from the programs partition). I didn’t do step 1, because the image size is much smaller than 80GB so I thought it’s enough. Yeah, I thought it would fit nicely also, since my image was only 51 GB big. However, it told me that it wouldn’t fit on my disk. Therefor I did partition my system drive just like 30 GB under the capacity of the SSD, so I was sure it would fit on the SSD. B: That there is no drive to clone to? I’d imagine, that if you try to partition your system drive down to 60 GB, it will fit on the SSD without any problems. So basically, partition it to 60 GB, make a new disk image of it, and try to recover from the DVD again. You have to remember, that Windows 7 has some hidden partitions also, so if your main partition is 80 GB it won’t fit on a 80 GB SSD. I’m not sure this will help you in your case, but that’s what I did, and it worked like a dream. Lemme know how you’re getting along. I’ve already tried something similar. I shrinked the system partition of the HDD to ~64GB, made a new image of it and tried the same again – nada! It doesn’t report anything has to do with space. It just states that there is no disk on which restoring the image is possible. Again – the SSD is recognizable drive as it shows also in command prompt. Maybe it expects to get a disk with the same signature or something. All I can advise you is to make 100% sure the disk is activated in your BIOS. Recovery mode might be able to exclude the disk, but if it isn’t activated in your BIOS, you won’t be able to put data on it. What you also could try is to let it be connected when you boot Windows, and format it in Windows. I don’t know if you tried that. So basically, make sure it’s activated in your BIOS, if that doesn’t help, take it into Windows, partition it there and format it (your SSD that is). Let me know how it’s going with that. 1. copy the hidden partition to SSD. 2. copy the system partition to SSD right after it. 4. changing the new system partitions’ in SSD letter to C via DISKPART from Win7 installation DVD. 5. Making the hidden partition in SSD to be active, again, using DISKPART. 6. It still didn’t work because of “boot failure”. I did restart, again, with the Win7 DVD and applied the automatic repair there – it fixed the trouble and it worked. 7. installed back the HDD – it didn’t do any problems and was just assigned different letters to its 1st 2 partitions(ie the hidden and system, the hidden is no more hidden now). I hope the above can be helpful for people who failed doing so your way(even though it isn’t a step-by-step because I didn’t write how exactly to use DISKPART). Thanks for you help dude. Do i need to set alignment on the X25-M if i wanna clone from my velociraptor HDD to the X25-M? No, Windows 7 own disk image tool will set the correct allignment. I tested this, and it works perfect. How do you check whether the alignment is good? btw, the win 7 disk image tool, it’s just like any other cloning tools that will clone the ENTIRE C:\ drive? So basically once i “clone” into my X25-M SSD, i input the values into this calculator and it will check whether it’s aligned? Sonic this is the best guide I have ever seen! I LOVE YOU MAN! 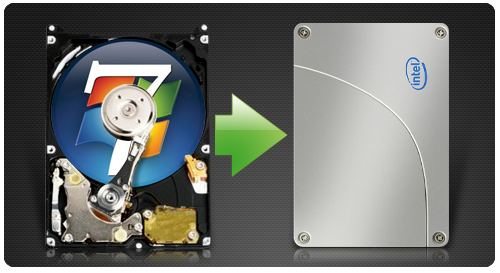 Used the FANTASTIC WIndows 7 image backup tool just like this guide says. Then I used the windows 7 repair disk to boot from. Once in the bootcd I ran the tool to restore from image. I had to run it a couple of times before it found the image (Odd). Once the scan did find the image it started to load but advised me I needed to restart and run the tool again. It does this because a reboot is required if your SSD isn’t already partitioned. After the restart I ran the tool again and it completed the restore perfectly. The author was 100% correct to suggest enabling AHCI in WIndows 7 and then in the BIOS. It improved ALL of my disk performance by 10%, enables NCQ and allows TRIM to function. Finally I used Partition Wizard to resize my OS drive from 69gbs to 74gbs. It worked perfectly. Now that you have a perfectly working TRIM enabled WIndows 7 install MAKE A NEW IMAGE! Backup Backup Backup! Then thank Sonic for all his hard work. Your the man dude! You have to change the start entry to 3(left that part out). I can only second Colin’s statement… thank you Sonic! This is a fantastic guide! Before finding this page I read many confusing forums that focused on alignment and third party imaging tools. Your recipe is way easier than anything else I found… and it worked! I had a bit of trouble due to the ~18 GB recovery partition that came with my Dell… but once I removed it and got my original hdd OS booting again, the guide worked almost perfectly for me. I had an additional hiccup during my first attempt to restore to my 60 GB vertex 2… apparently shrinking the OS partition on my hdd down to 50 GB wasn’t enough. I reduced it further to 40 GB and tried again, and it worked beautifully. I made a few other simultaneous adjustments… so I’m not entirely sure that it was the partition size that caused my problem. After failing the first time, I booted back into the original hdd OS, shrunk the partition, formatted the new ssd with zeros, and created a new OS image. It’s possible I had made a mistake with the first image, or that the factory delivered state of the ssd wasn’t compatible with the Windows 7 restoration tool. So for those of you for which this technique didn’t work the first time out… don’t give up. You probably just need to make some minor tweak somewhere. I have followed this guide but have a problem. When I go to repair to load the previously saved image, the system cannot see the drive. I saved the old image to an external hard drive. I have subsequently loaded Windows 7 Starter on the drive and can easily see the external drive but it is not identified when I go to repair. What can cause the failure to see the drive image in repair mode? Good question. I’ve heard of people having this problem before. I think what you might wanna do, is shrink your Windows 7 partition more, before making an image of it. If the image of your windows partition is bigger than your SSD, it won’t reckognize your SSD as a viable source for the cloning process. Try this, and lemme know how it goes. It was fairly straight forward too, which amazed me. Not too much with W7 is that easy normally. As a note, the only problem that I had occure was with the .pst folders for Outlook 2010, and that was only really because they are stored on another HDD so it didn’t link up straight away. All good now, Thanks for saving me days of setting and installing. @Greg I had the same problem and installed Win7 completly new on my SSD (I think this is the better alternative than first defrag and then shrinking). Then I cloned the old Win partition to the new. I used Norton Ghost but other tools would do the job also I guess. Do you think I need to save the recovery partition that came with my hp? I would like to delete it to save space. Also, just so I get it right, you want the installer to repair the image from the external drive to the target SSD? Will the installer automatically force this path? I am trying to create and image of my new HP computer and transfer to my 60GB OCZ Agility. I notice that when I try making the image it includes a 12GB recovery partition that causes the total image to go up to ~40GB. Anyone know how to remove the recovery partition to make the image smaller and save SSD space and if this will cause any problems? Thanks! Sonic – Great tutorial, thanks for posting. I have followed this process but am stuck getting 0x80042412 errors. My setup is moving from a 300GB HDD to a 160GB SSD (OCZ Agility 2) in a Thinkpad x201 running W7 Pro. Before I shrunk the partition, I got the 0x80042403 error. I think shrunk to ~30GB and now am stuck getting the 0x80042412 error. I’m wondering if copying over the OEM utility partition is creating an issue? Sonic, great guide, very clear. I’m also experiencing a problem–I am stuck on getting 0x80042412 errors when trying to restore. I shrunk the partitions on the original 300GB HDD to about 30GB and used the Windows tool to create the system image and boot repair disc. But when I try to restore to the (brand-new) 120GB SSD, it gives the 0x80042412 error “No disk can be found.” I tried re-shrinking the partitions to be exact size of the 120GB, that didn’t work either. If I boot into the bios with the SSD installed, I can see the SSD in the list for boot order. I’m not sure what else might be the issue? Grateful for any ideas. Resolved the issue. Copied my data to external HDD, reset my HDD to factory settings, then used the standard Windows 7 restore functionality to create backup of (now factory default) HDD, swap in new SSD, and restore from external. Thank you Sonic, every step of the guide worked as you stated. My config was a Lenovo T410 laqtop with a 320GB SATA drive, moving to a new Intel X25 160GB SSD. My goal was to do a simple and free transition from my large SATA drive to a new smaller SSD drive with no reconfiguration. I had planned to use EASEUS Disk Copy but that wouldn’t support my “downsize” requirement and I couldn’t do it locally to the laptop, would have required to use my desktop system. Your guide was exactly what I needed and everything worked as stated. Your steps allowed me to do everything on the T410 with only the addition of a large enough external USB drive (for the image) which I happened to have on hand. Sorry that your comments wasn’t posted guys. It was drowned in tons of spam this site recieved, so I had to sort it out manually 🙂 Thanks for all your kind words though, I am glad it helped many of you. @ BDD – You need to shrink your entire C: partition to be a bit under the size of your target SSD. When the partition has been shrunk, you do a disk image of it through Windows 7 Backup and Restore function in the control panel. If your backup image is from a partition that is say 260 GB big, it won’t fit on say a 160 GB SSD. I would say you would try and shrink your partition to like 60 or 80 GB, and then do an image of it, where after you can clone it to a 100 GB disk. Based on my experience, the safest way to transfer data with system is cloning the whole system located hard disk. also there is an good instruction to guide you. Firstly it said that I need to format the ssd. So I did it. Then it said that a disk (that I unplugged) was still active in the bios. So I checked everything, becouse it was inactive in the bios. changed some other things. Now it says it can’t find the ssd. The ssd is listed in the device that I can deactivate when going to restore win 7. Maybe I’m having problems becouse I have dual boot win 7/xp? In the image it created there are both win 7 and xp. There is for me no way to change it. I don’t have any intention of touching the xp. Maybe it’s giving me problems becouse I have the image on a hdd with 2 partitions? The reason I was trying the move of OS in your way, was becouse I corrected some functions in win 7 like activated quick launch, deactivated the unuseful toolbar in explorer. I also added xplorer 2, to be able to see the column folder size. I installed classic shell, to have a decent explorer. This to say that I worked many hours and changed windows 7 to make it “almost decent”. Still with win xp I have a better control on my os. I actually have 30-40 programs and games installed. I think I will have to reinstall win7 and everything (tank you microsoft) from the beginning. Waiting for a rainy day to do it. do any of you guys live in teh SF Bay Area..and wanna make a few bucks installing my corsair force 80gb ssd? I have a 250gb hdd that I want to clone to my new intel 160gb SSD but Im having a few doubts and I need some help!! I have acronis and I cloned my hdd to ssd allowing acronis to adjust the sizes in respect of hdd sizes. When I swapped over the drives after completing cloning it would not boot I replaced the original hdd and when I loaded the ssd within a caddy I noticed that the HP recovery section was in the red and nearly all used space! I have been scratching my head with this but I hope its an easy fix. I read the guide and most of the comments. Tried using the built-in Backup and Restore funtion in Windows 7 but since I’ve moved some of the stuff Windows 7 wants to backup on to my larger second drive the total backup Windwos wanted to make would exceed the capacity of my SSD. I installed the SSD in my system, formatted it using NTFS (in one big partition) and used the clone feature of the EASEUS program (did not the sector-by-sector method – I left it unchecked). Afterwards I enabled ACHI in Windows 7 using regedit and the guide in the article. Enabled it in BIOS and checked that TRIM is enabled (using the guide in one of the above posts). excellent tut, however neither that or the suggested fixes for the “No disk can be found” issue using DISKAPRT has worked. Eventually i actually installeda fresh win7 pro onto the ssd. Once done i booted into WinRE and tried restroing the image again (albeit the SSD now had proper partitions), but still got the “No disk can be found” error. so i booted into windows, loaded up Backup and Restore, but it couldn’t even find the image on the mounted usb hdd. ??? i’m totally stuck now, so any help would be most appreciated. BTW, this is for a laptop, hence the need to clone the drive as it has all the necessary drivers for everything installed. Win7 doesn’t find them all. Forgot to mention, i’m not to clued up on the alignment thing. Could this be causing the issue? I reduced the c: partition on the old drive down to 40gb before imaging it, so it should easily fit into the 80gb X25-M SSD. My C partition is 86GB of which 71GB is filled. I created a backup, which is about 60GB. I try to restore to 120GB SSD and windows recovery starts nagging about SSD being to small for my image and that it won’t be able to recover. Repair fails and I have to reboot. It works like a charm! Although I had to work through win 7 system backup and restore issues from external drive. I’ve noticed when doing the Win7 backup, that it sometimes wants to backup files from more than the C drive. This mostly happens when you have some of your system or program files spread over several partitions or disks. When doing the Win7 backup, does it say it wants to backup from any other partition than C:? Not really. Only C drive. The error code being 0x80042417. Hm, well I guess you have to delete your ssd’s partition, and reformat it. I think you can do so in Windows disk management. Nice guide… thought you might want to add in your steps for HDD prep PRIOR to imaging to an SSD would be to remove the Windows 7 hibernation file, this will give you back a few GB’S and it is really not needed. I am in the middle prepping my SSD and was looking to shrink it when I came across your guide. I downsized my HDD from 500 GB to 200 GB after defrag with Perfect Disk, using boot defrag, and resizing with my Partition software disk. Everything works great so far but when I look at my HDD in Win 7 Disk Management it shows on the resized partition “Healthy (Boot, Pagefile, Crash Dump, Primary Partition)” Are things ok to proceed?